Sunroad Enterprises seeks added flexibility amidst litigation between port district and Coastal Commission. SAN DIEGO — A request to modify plans surrounding a new hotel project at Harbor Island was delayed by Port of San Diego’s Board of Port Commissioners on Sept. 12. Commissioners will likely consider the proposed resolution in October; port district staff pulled the item off the agenda just before the start of the board’s Sept. 12 meeting. No reason was given for delaying consideration of the resolution. 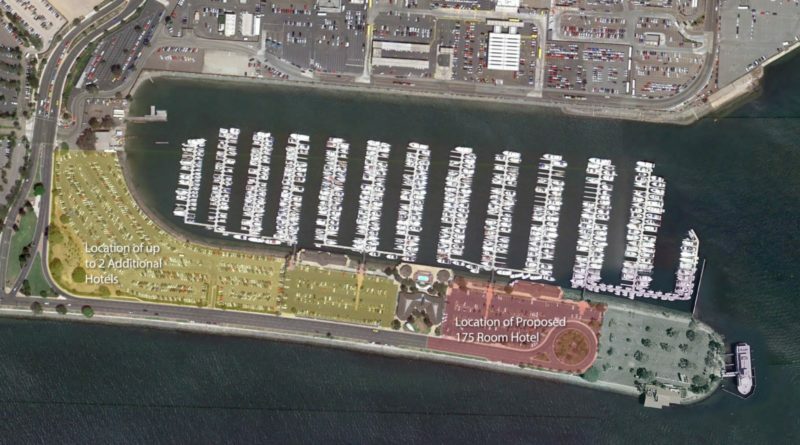 Sunroad Enterprises, which hopes to build a large-scale hotel project adjacent to Harbor Island’s boating marinas, formally asked the port district if it could move forward with its hotel project without being subject to a Port Master Plan Amendment. The request was made in light of a current lawsuit between the port district and California Coastal Commission regarding the project; the lawsuit, as of the Sept. 12 port district board meeting, remained unresolved. The resolution, if approved by the board, would allow Sunroad Enterprises to move forward with a plan to build a 500-room hotel – complete with a restaurant, cocktail lounge and recreational facilities, among other amenities – but maintain the flexibility to instead pursue the building of two additional hotels with 325 rooms. Plans to build a large-scale hotel development on Harbor Island – which is a destination for boaters and travelers out of San Diego International Airport – have been quite dynamic. A 500-room, one-building hotel was originally proposed, but plans later adjusted to potentially build multiple buildings. Oliver McMillan and Sunroad Enterprises were selected last year to pursue a hotel development on Harbor Island on behalf of the Port of San Diego. Both entities originally sought to pursue the hotel development on their own, but the port district opted to have Oliver McMillan and Sunroad Enterprises work together. The port district and Coastal Commission have recently been at odds over the eastern Harbor Island redevelopment. Commissioners denied a master plan amendment request by the port district in May, stating the Sunroad hotel project, at the time, was deficient in lower-cost overnight accommodations. Port district staff also delayed a presentation on blue economy incubation and discussions on the Port Master Plan Update. Coastal access and the harbor’s recreational element are the next two topics on tap in the Port Master Plan Update. The port district will be hosting a pair of public workshops and meetings in mid-October as part of its public outreach efforts. The port district also hopes to accelerate Blue Economy projects throughout San Diego Bay. Initial projects and pilot programs have already been initiated in areas such as aquaculture and “blue technology,” which is effectively a technology driver for clean power in marine vessels and similar ventures.